The Thanksgiving weekend is here and the UMD Bulldogs have played 14 games to date and have this weekend off. This leaves 21 games left on the schedule for the Bulldogs. So we decided to look back and grade the team at what has happened to date. We will start with the offense. UMD is currently third in the nation for team scoring averaging just over 4 goals a game and has five players with 15 points or more. We give the team an "A" for offense. On team defense UMD is currently averaging 2.50 goals against per game which is good for 17th in the nation. This is also good for the 2nd best in the WCHA in all games played. Individually the defensive players have played good. It has been great to see Dylan Olsen start off strong again and Justin Faulk be rock solid on the blue line. We give the team a "B+" for the defense. For special teams it has been a little up and down. The power play is clicking great, sixth best in the nation at 25%. The penalty killing has been below average though. Currently the team is 80% on the kill, the good thing however has been the four shorthanded goals. We give them a "B-" for special teams. The team will need to solidify their penalty killing throughout the remainder of the year if they truly want to make a run for the MacNaughton Cup and the NCAA tournament. As for goal tending, it is hard to say it is the Bulldog's weakest spot when you see a record of 11-1-2, but it is. UMD has been switching back and forth between Aaron Crandall and Kenny Reiter. Crandall has the better statistics and will likely be leaned on more the rest of the season. Wins, losses, and goals against are good stats, but the one we focus on a the HighHorse is save percentage because it measures what the goalie does with the shots on net. With only one loss it is hard to give the team a poor grade, but unless both goalies can get above 90% save percentage a "B-" is the best we can give. With the Bulldogs being the number one team in the nation the overall grade is an "A-." Yes there is always room for improvement, but if they keep skating they have the first 14 games of the season good things will happen for this team. The age old quandary is the needed mixture to create a championship team. UMD is a good current study. One can look at the attributes of the Bulldogs squad, fleshing out the positives and shortcomings in relation to championship chances. Here one will be examined, winning the close games. High power teams have sometimes been faulted, usually through no fault of their own, for beating teams at will and by comfortable margins. The question usually is asked about how a team will react when it comes down to the wire in a close game if they don’t have experience. UMD certainly does have the experience needed in close games. Check it off, it is complete. The Bulldogs are 6-0 in one goal games including 5-0-2 in overtime. But is it possible to play in too many close games? Maybe those against what should be inferior opponents? In 11 wins this season, the Bulldogs have won by more than two goals twice, and they have played teams like Alaska – Anchorage, Michigan Tech, and Providence. These are teams that UMD is definitely better than. Maybe the next check-off for the Bulldogs on the list to creating a championship team should be putting teams away with their scoring power. Now that is something I would like to see. Minnesota Teams. UMTC, MSUM, SCSU, and BSU are not helping the State of Hockey keep its name. Outside of Duluth, Minnesota Division I teams are placing 5th or below in the WCHA. The Gophers are the only Minnesota team that have an above 0.500 record thanks to a 5-1-1 current streak. Scary in Anchorage. It is not all about the split the Huskies gave up in Alaska, as if that wasn’t bad enough for the swooning SCSU team. It was the injury to SCSU’s Travis Novak that has us worried. He went hard into the boards and had to be taken off on the backboard. We hope the best for Novak as he recovers. Controversy in Omaha? After Friday’s game where North Dakota scored three straight goals in the third period en route to a come from behind 6-5 win, there was considerably more defense and controversy. Saturday’s game saw UNO under the direction of Dean Blais extracted revenge in the form of a 1-0 score. OK, revenge is a strong word, but this was a highly contested game where the lone goal was scored in the last second of the game. To add to the drama, the play that scored the goal started with a close onsides call at the blueline. Talked about long after the game, the final verdict is had to be freeze framed to see that it was maybe offsides. Consensus that it was a tough call…defiantely not a consensus if it was the right call. Either way, the split happened. The UMD Bulldogs travel to Madison this weekend with the best start after 12 games in school history, 9-1-2, and the #1 ranking in the nation. The only team with a better record is Boston University at 6-0-4. 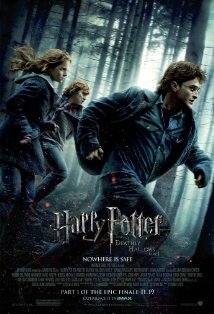 ﻿﻿﻿Just as Harry Potter sets to do battle in the first part of his finale in movie theaters, UMD battles to fight the seeming curse of the #1 spot. UMD is the third team ranked #1 in as many weeks. The goal this weekend is to play well. If that means losing the #1 spot, that is agreeable as long as the team, coaching staff, and fans can agree that the games were well played and the Bulldogs gain at least a split. Tough Row… UMD is again going into hostile territory, not only because it is not the DECC, but because they have struggled in Madison, no mater the building. The Bulldogs are 22-50-5 in their previous 77 games in Mad Town. Additionally, they have not swept the Badgers on their home ice in 23 series since doing so on February 8-9, 1985. That happens to be the last season Brett Hull played in Duluth while scoring 52 goals en route to an 84 point season. To top it off, the Badgers under Coach Eaves have faced a #1 team 11 times. In those games UW is 7-2-2. Something to Prove? UMD is not the only team this weekend with something to prove. The Badgers were the runner up in the National Championship game last season, so a lot is expected this year, right? In looking at the departures after last season, this season is an unknown. One thing for certain is the badgers take pride in their program and their home ice. After being swept last weekend the Badgers are certainly looking for redemption. All of the Positives. Freshman Justin Faulk continues to lead all Bulldog players in +/- rating with a +9. Blueline partner Dylan Olsen is tied for second with Jack Connolly with a +8. Heard AND Seen. This weekend offers plenty of choices to see the games on TV. Locally in Duluth, the Saturday game will be carried on My9. The Wisconsin feed can be seen on Fox Sports Wisconsin on Friday and on the Wisconsin Channel on PBS for Saturday night. For those in the Twin Cities with an antenna, and that just might only be me, you can pick up Wisconsin PBS 28.2, but that is if you are close enough to Wisconsin, likely just in the east metro area. Again, that may just be me. Outlook. We at the HighHorse have been picking UMD series correctly for three weekends now. I know that we don’t designate which night a tie or win is, but that is just plain difficult with college athletes. Looking at this weekend we both agree that the Bulldogs will come away with a split in Madison. North Dakota at Nebraska – Omaha: The #1 ranking for UMd garnered many headlines this week, but what was maybe lost in it all was the match up of UNO and the Fighting Sioux. UND takes the trip down to Omaha to face a Maverick team lead by Dean Blais who resurrected the Sioux into a national power. Oh, and North Dakota was the preseason pick to win the WCHA and UNO is the new upstart member vying for first at 8-1-1 overall. It is going to be electric in Omaha tonight. Unfortunately for the Mavs, UND is a team that will expose their young talent and take at least three points. And if UND wears their black alternate jerseys, then it is sweep and good night. The Sioux are 21-1-2 in the black jerseys since 2006-2007. University of Minnesota – Twin Cities at Michigan Technological University: This is two teams where you just don’t know what you are going to get when they take the ice. Up and down and round and round are good words to describe their season with on and off ice issues. In the end, MTU and UMTC will split in the UP. Bemidji State at Denver: Keep this one short and simple, Denver sweep. Saint Cloud State at Alaska – Anchorage: See struggles with MTU and UMTC. SCSU had high expectations at the beginning of the season, and now they are just trying to keep the ship afloat. Am I being too dramatic? Yes and no, or is it maybe…if the Huskies don’t sweep this weekend, they will likely not achieve a 0.500 record until AT LEAST the middle of December, if ever this season. The trip to Alaska is always difficult from a logistics standpoint. Add in a physical Seaswolves team that wants to slow everything down and you have the recipe for a split this weekend. The polls are out and UMD is #1 in the nation for all three rankings: USCHO, USA Today/USA Hockey Magazine, and INCH. This marks the fourth time UMD has been voted to the top spot and the first since October of 2004. The Bulldogs next opponent, the Wisconsin Badgers, are currently ranked 15th in all three polls. This upcoming Bulldog Hockey weekend feels more relaxed after a split last weekend at North Dakota. How tight would UMD be gripping their sticks Friday night is the Sioux had swept or even salvaged the tie last Saturday night? Let’s be real here. 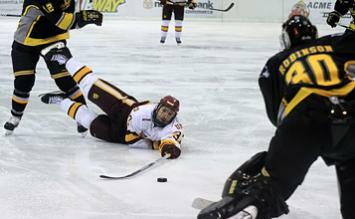 In recent years UMD has struggled with the cellar-dwelling MTU Huskies. Maybe someone should remind the Bulldogs that MTU started out 4-0-2 before getting swept in Madison in their last action October 29-30. Home Sweep Home. UMD is 4-0-0 at the DECC this season, their last in the building before moving to AMSOIL Arena in late December. During that stretch, the Bulldogs have outscored their opponents 21-6. UMD has four more games in the DECC including this weekend’s series. Power to the Huskies. Michigan Tech enters his weekend with the fourth best power play percentage in the nation at 30.6%. UMD is sixth best in the nation, but with 25.5%, a good distance behind the Huskies. On the flip side, MTU has been more efficient at killing power plays with a 84.6% rate compared with UMD’s 80.9%. The Bulldogs have made a name for themselves nationally in recent years based on their special teams. This weekend they will be challenged and need to step up their special teams games. Scorers Abound. The Bulldogs boast 5 of the top 20 scorers in the nation. They are Mike Connolly (4th: 7-9-16), Justin Fontaine (6: 6-8-14), Jack Connolly (9: 3-10-13), JT Brown (16: 5-7-12), and Travis Oleksuk (16: 6-6-12). Series Outlook. The Bulldogs gained confidence this past weekend and are tough at home. Even though MTU is resurgent at first look, the teams they have beat are not top tier teams. As a result, UMD will continue their home unbeaten streak and sweep the Huskies. Expect both games to be tightly played with close scores. Nebraska – Omaha at Saint Cloud State: Intriguing match-up with the upstart UNO team playing the underachieving SCSU Huskies in Saint Cloud. SCSU is having trouble with scoring and more importantly being scored on. One side says UNO is on the roll and they will sweep, but this is on the road in the WCHA. SCSU is also a hard one to sweep at the National Hockey Center. I can’t find the stats I had, but it has been years since that happened. The forecast is for a little snow and a split in Saint Cloud this weekend. North Dakota at Wisconsin: North Dakota has taken their lumps early this season with some losses and injuries. Still, as most UND teams do, they persevere and play good hockey. This weekend in Madison has an offensive power in North Dakota meeting the vaunted Wisconsin goaltending duo as described at USCHO. The Badgers have not faced an offense like this and it will show, but they are still playing at the Kohl Center, so expect a split. Alaska – Anchorage at Bemidji State: A big, physical team in the Seawolves make their first trip to Bemidji this weekend. Bemidji will get their first win in the new building, maybe. There win be at least one tie and no wins for UAA. Don’t be surprised if there are two ties here this weekend. Minnesota State – Mankato at Denver: Denver is coming off of a disappointing blowout loss against their rival CC. A hard week of practice has them focused as Coach Gwozdecky is known for. Couple with a young Mankato team playing on the road and you have a Denver sweep. CC at Air Force (Fri.) and Yale at CC (Sat. ): CC gets a break from WCHA play, but not a break from their up and down season. CC could even be swept this weekend, but it is most likely to see a split. A telling weekend starts tonight as UMD again travels along US Highway 2, this time passing through Bemidji, on their way to Grand Forks. The weekend is important in this young season to see where this Bulldog squad really is on the national scene. UND is the first team with a winning record and the first ranked team they face. All this is will happen in the house of horrors for UMD, Ralph Engelstad Arena where the Bulldogs are 1-10-1 in their last 12. The Sioux record is telling in their up and sown season leading to their 4-3-1 start. UND is 2-3-0 against nationally ranked opponents and 1-1-0 at home. The Sioux are looking to make a statement this weekend after being swept two weeks ago at Maine and splitting last weekend at home against Denver. But maybe that is just who they are, either the typical slow starting Sioux teams of past years, or, dare I say, an average to above average UND team. Without question, it is an opportunity that UMD can ill afford to pass up. More Pluses. Two outstanding Bulldog Freshmen lead the team in plus/minus. Forward JT Brown and defenseman Justin Faulk are tied with Junior Travis Oleksuk with a +5. Great achievement eight games into the season for Freshmen, especially with Faulk who works the blueline. Power is Key. After their first game, the Bulldogs are 27 for 29 in killing power plays. On the road against a team like NoDak, killing penalties will be a key to the weekend. Make it a Good One. Bulldog forward Justin Fontaine celebrates his 23rd birthday on Saturday. Fontaine is currently second in scoring on the team with 4-8-12 in eight games. Outlook. The Ralph is always a challenging place to play the Sioux, especially for UMD. This is a good time, if there is such a thing, to play at Grand Forks. It will be a successful weekend for the Bulldogs in taking a split and their first loss of the year. Colorado College and Denver (home and home): The first series in the race for the Gold Pan is on this weekend. Denver is coming off of a split at North Dakota and CC is coming off of a home sweep from UMTC. Both teams are still trying to find their place in this early season. Both teams have had impressive wins and baffling losses. I would think DU sweep, but this is the Gold Pan and it is home and home, so a three pointer for Denver is in order. Bemidji State at Saint Cloud State: The way Bemidji can clog things up and the Huskies ineptitude to score, this series should be a low scoring series. BSU will come away with one point and still no wins in the WCHA. Minnesota State – Mankato at University of Nebraska – Omaha: In the renewal of the Maverick series, these two Maverick teams are headed in opposite directions. Purple Cows (Mankato) are up in the WCHA standings thanks to six conference games already (most games tied with UMTC) and they have been against fellow bottom feeders. The Red Cows (UNO) is surprising many with their hot start in the new WCHA. The Red Cows sweep the Purple Cows this weekend. University of Wisconsin at University of Minnesota – Twin Cities: A toss up this weekend. I think that both teams are figuring out who they are this season and they both will be middle to upper half of the conference. Both teams haven’t really played any good teams so records are deceiving. And just as the Gophers are figuring things out, they lose a player, Zach Budish, for the season. With the uncertainty I have to say split, but don’t be surprised if Bucky comes away with three or more. The Bulldogs are up and comers. First in the WCHA, second in the polls and rankings. But how has that resume been amassed? Against teams with losing records. The total records of the UMD opponents is a whopping 6-15-5. Make no mistake, UMD is a good team with the talent to go far this season, enough experience to make a run into April even. But we still need to see how the Bulldogs do against the “contenders” in the upcoming weeks. The weekend against Bemidji was a hard fought, grueling weekend for the Bulldogs. In talking with the rest of the HighHorse staff, we kept coming back to what we believe the BSU style of hockey that has given UMD fits over the years since the Beavers jumped to Division I. It was no different this past weekend. Every time that UMD seemed to get the upper hand, BSU came back and pushed for, and achieved, the momentum time after time. BSU never held a lead in the weekend, good right? But let’s look at it the opposite way. UMD lost the lead both Friday and Saturday. The upcoming weekend at Grand Forks will be a telling weekend if UMD should be at #2 in the nation or not. Rankings. As it was stated above, UMD is ranked at #2 in the two national polls and the INCH Power Rankings. It is hard to put much stock into rankings at this point seeing that the Ivy League just started playing last weekend and the haves and the have nots still need to be shaken out. Goalie Play. Another weekend of Reiter and Crandall splitting starts, but in reverse order with Crandall starting Friday. Two more nights of decent play kept UMD in the games enough to take three points. It was a little bit of an adventure with Crandall Friday as it looked like he was out of control multiple times, but he did get the job done. And another win putting him at 3-0-0. Reiter had less goal support…again, even on Saturday night instead of Friday. He was up to the task, but let in a shot off of a SLOW one-timer pass. At this point, I think that the play of the goalies indicate that the #1 job is still up for grabs. Gophers Back. A sweep of CC brought the Gophers back into the picture in the WCHA. Their six points put them at third with two more games played than the rest of the top teams. Kent Patterson in net seems to be the guy, at least for now. Sioux Shutout at Home. In a rare shutout in Grand Forks, Denver salvaged a split in North Dakota. UMD will go to Grand Forks for their next series.